This Nativity scene includes the Holy Family, two female standing angels with curly hair, and two male flying angels. The Joseph figure stands 11.5 inches tall. The pieces are carved from cedar wood by the Jimenez Family: the mother, father, and many kids are involved in the process. The family lives in Masaya, a town close to Managua, the capital of Nicaragua. 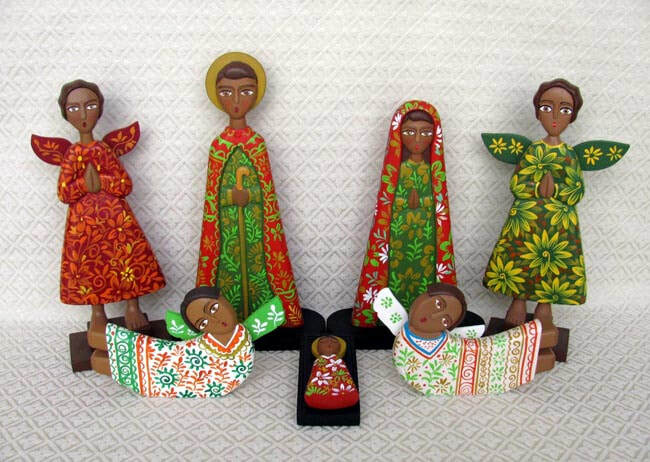 After this family completes their carving, the pieces are painted on both the front and back by other artisans in Managua. All of the figures are painted in bright floral designs, making each set one-of-a-kind.